My friend made a salad for a New Years Eve party and it was so good! It was really filling and the popped rice added a crunchy texture that pulled everything together! When I asked her for the recipe she told me that even though she loves it she only makes it once a year because she knows it’s not “healthy.” I told her that I would love to make a version that is just as rich and delicious as the original but with healthier fats and fewer calories. So this is what I did: I swapped the white rice in the original recipe for brown rice and added some roasted veggies and pumpkin seeds. 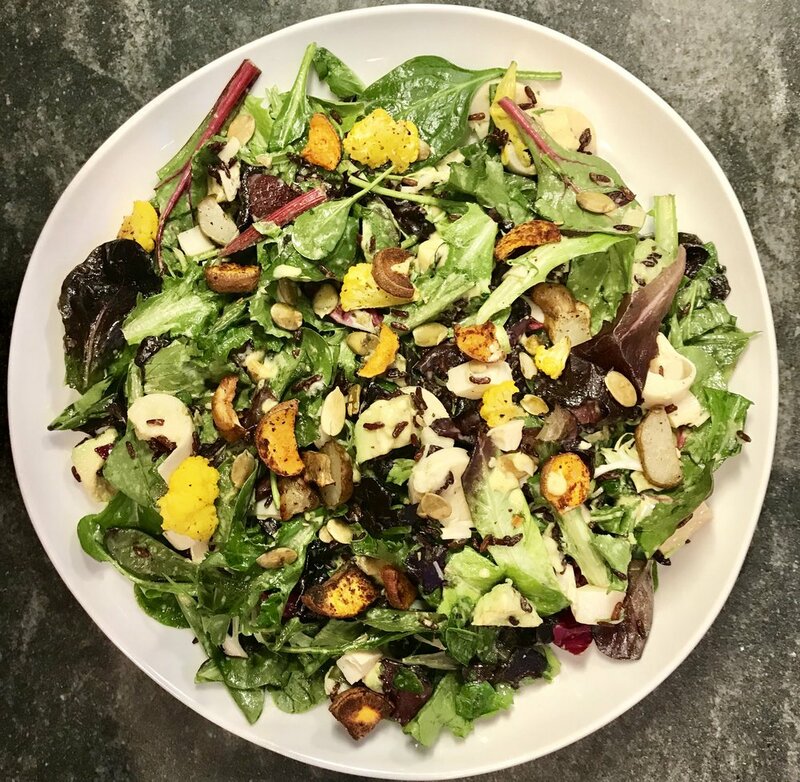 Finally, instead of using jarred mayonnaise, which is what the original recipe called for, I made a homemade dressing with healthy olive oil and none of the inflammatory vegetable oils or sugar that store bought mayo is made with. The result was delicious! My whole family loved it! This salad is really an amazing, hearty meal in itself but feel free to add some grilled chicken, shrimp or any other protein if you’d like! Preheat oven to 375 degrees. Toss cauliflower, sun chokes and sweet potato with olive oil, salt and pepper and roast until golden brown. The cauliflower will take less time than the sun chokes and potatoes, about 25 min, so remove the cauliflower when it looks done and continue roasting the other veggies until they are done, for about another 15 min. While the vegetables are cooking, wash and roughly chop all lettuces and put in a large bowl. Add scallions, hearts of palm, avocados and pumpkin seeds. Heat a heavy-bottomed saucepan with a lid over medium-high heat. When it’s hot, add 2 tbsp. olive oil. Swirl the pan to coat the bottom with oil. Add rice and stir to coat the rice with the oil. Cover the pan and shake until you can hear the rice popping. Reduce heat to medium-low and keep shaking the pan until the popping slows. It doesn’t make the same noise or fly up against the lid like popcorn does, so you need to listen closely. Once the popping slows, remove pan from heat and take off the lid. Combine egg, mustard, vinegar, ¼ cup olive oil and salt in a bowl. Using an immersion blender pulse for a minute to break up the egg. With the blender running, slowly add the first ¼ cup of oil a little bit at a time. Make sure each addition of oil is blended before adding the next. The mixture will start to emulsify. Once the first ½ cup of oil has been added, you can add the rest more quickly. Add as much of the oil as needed to reach the consistency you prefer. The more oil you add, the thicker the mayo will become. You may not need to use all of the oil to reach your desired thickness. Add roasted veggies and popped rice to the large bowl. Toss with dressing right before serving. Save leftover mayonnaise in a mason jar for up to a week in the refrigerator.